All histology cassettes are specially made to be used either manually or in any leading cassette labeling instrument. Made from Acetyl Polymer, which is a special high density polymer that keeps specimens safely submerged in solution. These cassettes are totally resistant to most histological solvents and their slots offer maximum flow through for good fluid exchange and proper drainage. The lids either come attached to the cassette or are packaged separately. 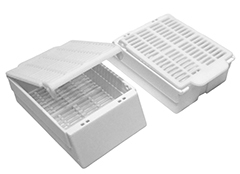 The lids can be opened and closed as often as necessary and they always relock securely without danger of specimen loss. Large labeling areas are located on three sides of the cassette for your convenience. Each slot measures: 1 x 5 mm, total 128 slots per cassette. Available in 11 different non-cytotoxic, non-metallic colors. Anterior writing area is at 45° angle to make the cassette universal. 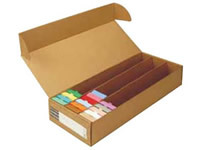 Ordering: Each case contains two dispenser boxes of 500 cassettes and one dispenser box of 1000 lids. Each case contains three dispenser boxes of 500 cassettes with lids already locked in place. 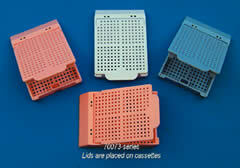 Similar to the above slotted cassettes but especially designed with 1 mm square mesh for small biopsies. Ordering: Each case contains two dispenser boxes of 500 cassettes. Ordering: Each case contains 3 dispenser boxes of 500 cassettes with lids already locked in place. Made from Acetal Polymer. 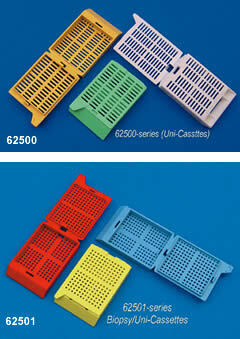 These biopsy cassettes can hold up to six tissue specimens, each one placed in its own compartment, numbered from 1 to 6 and measuring ¼" x 7/16" x 3/16" D (7 x 12 x 5 mm). Cover and base have over 3000 0.36 mm square openings. Cassettes keep specimen safely submerged in solvent and are totally resistant to the most histological solvents. The efficient flow-through slots maximize fluid exchange and insure proper drainage. The one-piece integral lid eliminates the need for separate steel lids. Large labeling areas are located on three sides of the cassette. The anterior writing area is at a 45° angle, making the cassette, to some degree, able to be used with certain types of cassette labeling instruments. Each case contains 2 dispenser boxes of 250 cassettes with covers assembled. Made from Acetal copolymer – Disposable plastic tissue cassettes are suitable for holding and identifying tissue samples in processing, embedding, and sectioning procedures. The cassettes fit securely in microtome chuck adapters. They are molded from a high-density polymer that is totally resistant to histological solvents. 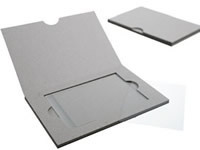 These cassettes are designed to accept standard metal lids (#70025-10) and will also fit either the standard stainless steel base molds or the disposable plastic ones. Only Clear cassettes are made of polypropylene. All other cassettes are made of Acetal Polymer. Each case contains 3 dispenser boxes of 500 cassettes. Stainless Steel Lids order separately. Made from acetyl polymer This new version of Micromesh™ offers 1676 square openings (0.38 mm) allowing for a greatly improved fluid exchange without having to use the biopsy pads. Large anterior and posterior slots in both cassette and cover ensure that the Micromesh™ biopsy cassettes will sink rapidly (far better than cloth mesh cassettes). A large square compartment measuring 27 mm is perfect even for needle biopsies. The cover does not protrude above the cassette, a great space saving feature allowing more cassettes to be stacked in automatic labeling machines and tissue processors. Patented "Fluidic Flow" pore design maximizes reagent exchange. IP ActivFlo Biopsy Cassettes feature innovative V-shaped 0.67 mm pores that pull fluid in and force air out. Sloped walls create a basket for small tissue management. The one-piece cassettes with 'frangible lids' have been designed for the Leica IPC Cassette Printer, with <1% printing error rate. IP Biopsy VI cassettes are two-piece biopsy cassettes with 0.67 mm pores, 45 degree writing surface and a secure latch closure. Taped cassettes have been designed for the Leica IPC Cassette Printer and offer <1% printing error rate. Ideal for needle biopsies and small tissues. Activflo Mini Cassettes are one third the size of standard cassettes, and feature sloped walls, creating a basket for small tissue management. The smaller size allows double the number of blocks to be stored, reducing specimen storage space. 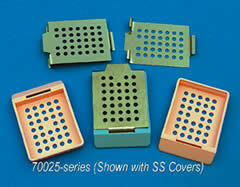 EMS introduces multi-compartment biopsy cassettes, with 2, 4 and 9 compartments. They have 0.6mm holes for added efficiency. Made from high density acetal, with easy to open and close lid. Preassembled. Resistant to histological solvents like alcohol and xylene. Made from acetal copolymer – This newly patented cassette, allows you to load the Micro-Writer® and Shur/Mark® Cassette Labeling Instruments in one simple operation. Each convenient stack contains 50 unique cassettes. No more manual insertion one-by-one. Save time and money. Two types of cassettes are offered in order to suit your needs: Slotted tissue cassettes and meshed biopsy cassettes. The anterior printing area is a 45° angle which suits most cassette labeling instruments. Lids are available as one-piece disposable plastic. It can be opened and closed as often as necessary and it always relocks securely without danger of specimen loss. Cassettes are packaged in stacks of 50. Each case contains 2 boxes of 20 stacks. Order cassette bases and cover separately. Molded from a special high density acetal polymer, they keep specimens safely submerged and are totally resistant to the chemical action of solvents used in histology laboratories. The efficient flow-through slots maximize fluid exchange and ensure proper reagent drainage. Available in 11 colors. Molded from a special high density acetal, they keep specimens safely submerged and are resistant to the chemical action of most solvents used in histology laboratories. The efficient flow-through slots maximize fluid exchange and ensure proper reagent drainage. The one-piece disposable plastic cover is pre-installed on each cassette and eliminates the need for reusable steel lids. The cover can be opened and closed as often as necessary and will always relock, reducing the possibility of specimen loss. The anterior printing area is at a 45° angle and offers an unobstructed view of the writing surface. Cassettes are packaged in stacks of 40. Each case contains 50 stacks for a total of 2,000 cassettes. Available in 11 colors. Molded from a special high density acetal, these tissue cassettes keep specimens safely submerged in liquid and are totally resistant to the chemical action of solvents used in histology laboratories. The efficient flow-through slots maximize fluid exchange and ensure proper drainage. The one-piece snap-latch and hinge-lock design prevents early separation of base and lid and allows one-hand operation. Lids are attached in an open position for easy filling, but can be opened or closed as often as necessary and will always relock securely. The tab on the left front side makes opening easy. Lids are easily removed by pulling sideways. The anterior writing area is at a 35° angle. Cassettes are packaged in stacks of 40. Each case contains 25 stacks for a total of 1000 cassettes. Available in 11 colors. Molded from a special high density acetal, they keep specimens safely submerged and are totally resistant to the chemical action of solvents used in histology laboratories. The efficient flow-through slots maximize fluid exchange and ensure proper reagent drainage. The cover does not protrude above the cassette, a great space saving feature. The anterior printing area is at a 45° angle and offers an unobstructed view of the writing surface. The one-piece disposable plastic cover is pre-installed on each cassette and eliminates the need for reusable steel lids. The cover can be opened and closed as often as necessary and will always relock, reducing the possibility of specimen loss. Cassettes are packaged in stacks of 40. Each case contains 50 stacks for a total of 2000 cassettes. Available in 11 colors. These cassettes will also load in those cassette labeling instruments in one simple operation. Save time and money with these convenient stacks of 40 cassettes. Just load the cassette sleeve in the magazine and you are ready for printing. These specially designed cassettes differ by the special hinge that holds the base and cover together. This hinge allows the Swingsette to be opened and closed as often as necessary. Anterior printing area is at a 45° angle, offering an unobstructed view of the writing surface. Available in 11 colors. The Micromesh offers 1676 square openings (0.38 mm) allowing for a greatly improved fluid exchange without having to use biopsy pads. Large anterior and posterior slots in both cassette and cover ensure that the Micromesh Biopsy Cassette will sink rapidly. A large square compartment with a side measuring 27 mm is perfect, even for needle biopsies. Molded from a special high density polymer, these patented cassettes keep specimens safely submerged in liquid and are totally resistant to the chemical action of histological solvents. The Micromesh mesh ensures efficient fluid exchange and drainage. The one-piece integral lid eliminates the need for separate steel lids. They can be opened and closed as often as necessary and they always relock securely without danger of specimen loss. The cover does not protrude above the cassette, a great space saving feature. Anterior writing area is at a 45° angle to make the cassette more suitable to be used with automated cassette printers. Cassettes are packaged in stacks of 40. Each case contains 50 stacks for a total of 2000 cassettes. Available in 11 colors. Made from Acetal-Polymer. Comes complete with a one piece integral lid. 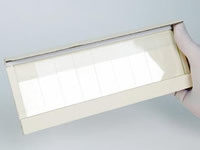 It is specially designed to hold large specimens during the embedding process, as well as in a storage cabinet. Inside measurements: 29 mm (L) x 25 mm (W) x 11 mm (D). Made from PVC with excellent thermal exchange. Specially designed for the Macro-Cassette above. It has a smooth interior finish and rounded corners to facilitate its removal. Will resist temperatures from -80°C to 60°C. Not to be used with xylene or acetone. Measures: 37 x 24 x 10 mm, and 5 ml volume. Supa Mega Slim Cassettes are an innovative solution for the processing and embedding of large tissue specimens. The Supa Mega Slim Cassette is half the depth of a conventional Supa Mega Cassette. The reduction in the specimen thickness offers significant improvements in processing time, and ensures distortion free, consistent high quality tissue processing. 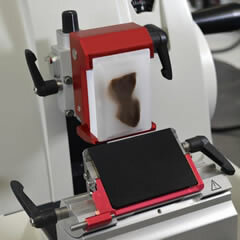 It also offers other significant time savings for the end user, such as reduction in the time required for trimming of blocks, and quicker embedding of specimens. When used in conjunction with the specially developed Supa Mega Slim embedding mould, Supa Mega Slim blocks have been shown to cast in 20 minutes at -8°C, compared to 50 minutes for conventional Supa Mega Blocks. The novel hexagonal pore design, arranged in a honeycombed structure, offers a greater open surface area, compared to the slots of conventional Supa Mega Cassettes. This ensures a more efficient flow of reagents during processing and reduces carry over of reagents. The increased open surface area also reduces the occurrence of embedded specimens being separated from the cassette when sectioning fibrous specimens, as it significantly increases the binding between the embedded tissue block and the cassette. The Supa Mega Mother Ship allows the use of a standard tissue processing cassette to clearly print a 2D barcode and test information, thus eliminating the potential risks associated with hand writing on cassettes. Supa Mega Mother Ship cassettes are designed using a docking area for standard processing of cassettes. They have a strong hex pore structure which improves processing for large specimens. Elimination of the possibility of the embedded specimen being separated from the cassette when sectioning fibrous specimens. HiQa™ Microscope Slides are high quality assured. 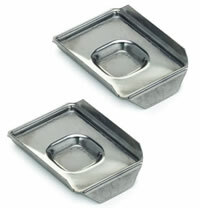 They have 90 degree ground edges for safety and are available as Plain or Twinfrosted, and in Mega and SupaMega sizes. These high quality slides are cellophane wrapped, pre-cleaned, ready to use, and suitable for use with automatic coverslipping machines. Histobond® + Supa Mega Slides are designed for mounting large sections of neuro and breast tissue. Manufactured from the highest quality white glass, with an innovative positive charge coating, Histobond® + Supa Mega slides offer exceptional adhesive properties and provide a superior coverage of reagents across the slide. These slides have a 'Right Side' indicator (RS) to help ensure users correctly orientate the slide, as well as a 7 mm marking area across the width of the slide in order to maximize the working area. HiQa™ Supa Mega Cover Slips are made from transparent hydrolytic class 1, flaw-free glass. They are guaranteed to be of the highest quality. These robust cardboard mailers are constructed from a one-piece moulding that provides a high level of protection for Mega and SupaMega slides. 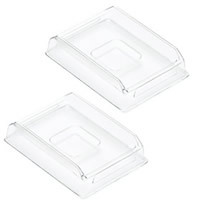 These economical trays are constructed from solid board. There is a variety of conventional 9 and 24 slide trays available, holding either 8 / 24 Mega Slides, or 4 / 12 Supa Mega slides. The BlocStor range of tissue block storage products is manufactured from recycled fiberboard and provides a cost-efficient archiving and storage solution. All boxes are designed for strength, rigidity, long term archiving of tissue blocks, and for maximum utilization of storage space. Every BlocStor is supplied with a pre-printed archive label for clear identification and rapid retrieval. BlocStor boxes are available assembled or flat-packed for efficient use of your space. 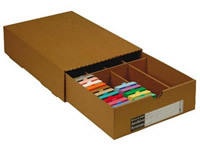 BlocFile 1 is an economical drawer system for block storage. Manufactured from high-density fiberboard for strength, rigidity and durability, the BlocFile offers an economical solution to the problem of tissue block storage. The Stainless Slide Rack Adapter for Mega and Supa Mega Slides enables the user to stain both Mega and Supa Mega slides on automated staining equipment, bringing convenience, efficiency and cost saving all at the same time. 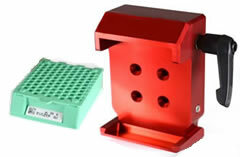 This makes the slide rack adapter ideal for all laboratories looking to improve their processes. The Supa Mega Cassette Clamp is used during the microtomy of large tissue blocks. 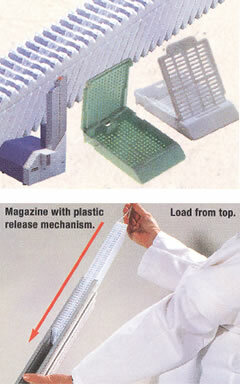 Incorporating an intuitive quick-release system, the clamp can securely hold any Supa Mega tissue processing cassette. 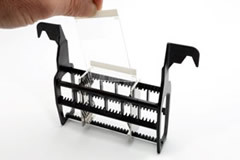 Unlike other large tissue block clamps, the Supa Mega Clamp's unique design allows sectioning all the way through the Supa Mega block without collision between the clamp and knife block. Mega and Slim base molds work nicely with this design and the possibility of the cassette being attached in the wrong orientation is eliminated. Compatible with Leica Biosystems RM2100 and RM2200 and Thermo Scientific Microm HM series of microtomes. Cassettes sold separately. The Supa Mega range of stainless steel base molds have extra deep side walls allowing wax to be decanted into the cassettes during embedding without the risk of the usual leakage of wax. The smaller faced mold also saves wax on medium sized blocks too large to fit into standard cassettes negating the use of full size molds. Reusable. Made of Stainless Steel for a lifetime of use. Fits most standard tissue embedding cassettes. Stainless steel construction provides superior thermal conductivity. 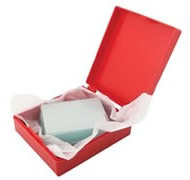 The molds have a highly polished surface for easy paraffin block removal and cleaning. The well corners are rounded for effortless tissue block removal and optimal paraffin ribboning. Clear plastic. Eliminates use of cleaning solvents and release compounds. 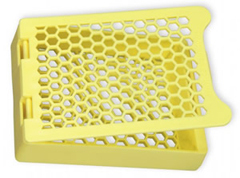 Disposable base molds are manufactured from high impact polystyrene, offering a low cost alternative to stainless steel. 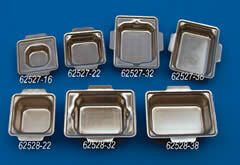 These molds are available in a choice of sizes and depths. 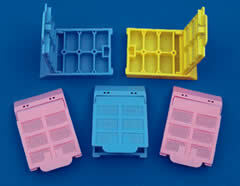 The molds have a smooth interior finish and rounded corners for ease of removal. There are five molds per strip and they are packed 100 strips to a case. Tissue-Tek® Uni-Cassette® System is now easier to use in every way. It is made from a solvent and decalcifying solution resistant plastic and comes with a snap-latch hinge-lock disposable lid. The cassettes have three textured writing surfaces. Biopsy/Uni-Cassette® cassettes are the same Uni-Cassette® but feature 1 mm pores instead of slots, which eliminates the warping of most small specimens and reduce the risk of specimen loss. The perfect cassette for the smallest specimens. The EMS Mesh Biopsy Cassette System is now the easier, ideal way for processing the smallest of biopsy specimens. Using EMS Mesh Biopsy Cassettes, you avoid reagent carryover in the tissue processor and you eliminate the structural artifacts usually caused by sponge and tea bag abrasion. They also allow direct specimen filtration into the cassette and facilitate embedding. 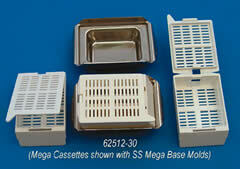 These base molds are to be used with Tissue-Tek® embedding cassettes and Tissue-Tek® Uni-Cassette® cassettes. 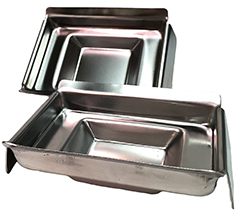 These molds are made from polished stainless steel, offer optimal thermal conductivity, as well as easy paraffin block removal. All corners are precisely rounded for optimal paraffin ribboning. 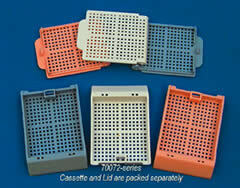 Mega-Cassette® cassettes have been designed to accommodate a large variety of samples, including bone, eye, teeth etc. They are made from white plastic with a snap latch, hinged-lock, disposable lid. These cassettes have three large writing surfaces and are resistant to solvent and decalcifying solutions. Measures 30 mm(L)x24 mm(W)x11 mm(D). 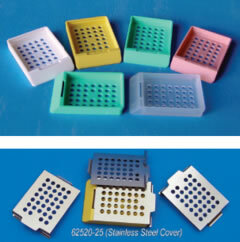 A stainless steel, reusable base mold is available. Measures 31 mm(L)x23 mm(W)x13.5 mm(D). Made from chemical resistant plastic. These cassettes have an angled, texture writing surface, ensuring positive identification throughout processing, embedding, sectioning and storage. Stainless steel cover is available separately. Made from polystyrene and reinforced with the dual bar center support to prevent warping, these rings have a cross-hatch surface design that provide excellent paraffin bonding for clamping and sectioning. Made from high quality stainless steel for optimal thermal conductivity, and they have a well polished surface for easy paraffin block removal. All of the corners are rounded for good paraffin ribboning. 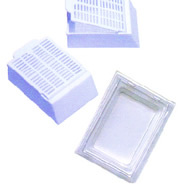 These Base Molds are for all applications in specimen embedding with Tissue-Tek® Embedding Rings shown above. Base mold release compound. Excellent for use as a base mold coating to allow for easy separation of paraffin from the base mold. Helps to prevent paraffin build-up on metal base molds. 150 ml bottle.